Just What Are Those White Spots On Ceres? NASA's Dawn spacecraft is edging closer and closer to the dwarf planet Ceres, producing the best ever photograph ever taken every time it sends data home. But the more we see, the more the mystery deepens. Just what are those freaking white spots?! I'm serious: we don't know what they are. We saw the original white splotch, a regional brightening in albedo, all the way back in 2004 when the Hubble Space Telescope produced the most detailed photograph we had of Ceres for years. 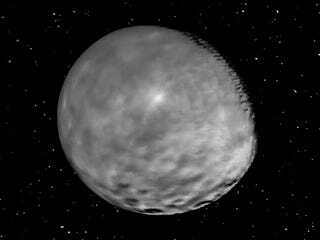 Now that Dawn has taken over the title of best photographer of the largest body in the asteroid belt, the mystery is just getting stranger. Instead of one spot, we're finding freckles. The spots are areas of slightly increased reflectiveness, representing barely a 9% higher albedo than the surrounding surface. The resolution of the photographs are currently at 14 kilometers (8.5 miles) per pixel, so we don't yet have enough detail to resolve if these are pinprick spots, or brighter regions that are blurring into points through our fuzzy vision. At its most basic, new is shiny while old is dull, so whatever these spots are, they're likely to be younger features than the surrounding terrain. An albedo around 0.12 isn't enough to make sense for clean ice, but space is filthy so even recently exposed doesn't need to be shiny-clean. We've seen ice at the bottom of craters on the moon; the same could be happening on Ceres with every splot marking a dent in the dwarf planet. Ice could have caught on prominence, the asteroid equivalent of snowy mountaintops with the lack of atmosphere and weather dictating an entirely different formation mechanism. Neither of these ideas mesh with our concepts of the surface temperature and internal dynamics, but bright spots can be indicative of melt ponds or even cyrovolcanics. If so, we're going to be really, really surprised by how something so cold, so small, and so far away from something massive to gravitationally massage it can have that kind of thermodynamics. On a similar theory, it could be some sort of icy geyser, although if it is, we'd be just as confused about how the thermodynamics of that little system are working. Secret military bases à la Ender's Game, or an inspection sticker as hypothesized by XKCD. Do you have any ideas? Place your bets now on what we'll see as we keep getting closer!